Modernise and open up your home with custom made mirrors and shower screens. A mirror in the right place can enhance and create the appearance of more space. Both our mirrors and shower screens are custom made and are versatile enough to adapt to numerous configurations and applications. We provide optional stylish shelves or handles and the highest quality of fixings to match customers individual décor. We only use toughened Safety glass and you can choose from clear glass or feature glass to create your custom design. Create a beautiful and relaxing ambience in your bathroom by installing a frameless toughened glass showerscreen which can be custom made to compliment your bathroom design. Our frameless toughened glass screens enclosure are made of solid 10mm Toughened safety glass incorporating highly polished finished edges which makes the panels strong and sturdy enough to use minimal metal fixings. 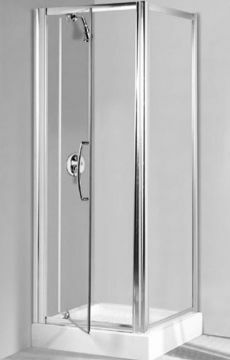 You have a choice of brushed finish or mirror polished look to choose from to secure panels in place instead of supporting them. This eliminates the awkward cleaning that a shower screen requires because there is no frame or track where water and debris can lodge. Cleaning is easy using a squeegee to wipe clean the glass keeping it immaculately clean. A yearly check by tightening the screws the addition of a 1 in 3 oil to the hinges is all that is required to maintain the panels and fittings. To complement your Frameless toughened glass showerscreen, we also produce and install toughened safety glass with colourbacked painted and textured coatings finish for bathroom feature walls, and we can supply and install custom made mirrors. An innovative profile which is uniquely shaped to direct water back into the shower and with its smooth contour profiles gives the classic design a contemporary look. Its uniquely shaped profile minimises soap residue accumulation reducing the need of cleaning. The suite also incorporates a revolutionary Positive Close Magnetic catch which ensures the door closes perfectly in line each time. Pivot Patch fittings elegant unobtrusive door pivots are colour matched to co ordinate with the frame and is available in a variety of colours. Stainless steel hinges pins are designed to give a life of trouble free. Semi Frameless Shower is glazed with 6mm Toughened it is strong and durable and can be made to almost any configuration. Uniquely shaped profile an innovative profile which minimizes water from running out of the shower. 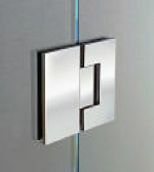 The suite also incorporates a revolutionary "magnetic catch" closing mechanism. Your choice of 'patch' or 'rail' fittings. Due to its modern slimline frame cleaning is a breeze. To keep the glass immaculately clean a daily squeegee wipe is recommended. Give your bathroom a face lift with Mobile Glass & Glazing Splashscreen - available in frameless designs for a seamless modern feel or with a channeling system. 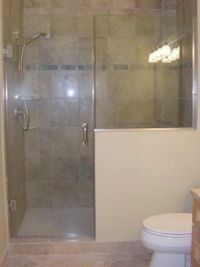 We also offer shower doors on top of bathtubs for the ultimate space saving solution. Cleaning is easily done with a daily squeegee wipe to keep the glass immaculately clean. Mobile Glass & Glazing has the pleasure in providing a comprehensive range of frameless shower hardware designed to provide architects, designers and consumers complete freedom in designing the most functional and stylish frameless shower enclosure. The range is engineered to exacting tolerances, using the highest quality brass and stainless steel components. Available in Chrome Plated, Satin Chrome Plated, 24k Gold Platted and Polished Brass. Mobile Glass & Glazing has the pleasure in providing a range of shower handles and door knobs designed to provide architects, designers and consumers complete freedom in designing the most functional and stylish frameless shower enclosure. The range is engineered to exacting tolerances, using the highest quality brass and stainless steel components. Available in Chrome Plated, Satin Chrome Plated, 24k Gold Platted.